One of the first considerations when choosing a fundraiser is profit margin. You want to choose the most profitable fundraiser possible, while also considering product quality, the price point for your supporters, and simplicity. As you search for your perfect fundraiser, you’ll definitely come across the ones listed here. In this list, we break down the profit margin and minimum order costs of some of the most profitable fundraisers on the current market. Frozen cookie dough isn’t the most profitable fundraiser on the market, but it’s affordable for your supporters, and has a sentimental aspect, as moms idealize the scene of baking cookies with their kids. There are all sorts of varieties and brands to choose from. However, profit margins vary widely depending on how much you order upfront. You may find success with cookie dough, but be prepared to spend a big chunk of cash if you want a 50% profit margin. Fruit snacks generally have higher profit margin ranges than cookie dough. Popular fruit snack brands offer their products for you to sell. They also require much less spend upfront. The weakness with fruit snacks is simply the product itself. They’re less exciting than other options, and they can be found in any retail store. Scratch cards are simply sheets of paper with hidden dollar amounts underneath multiple scratchable surfaces; just like a scratch-off lottery ticket at a gas station. You ask supporters to pick a number, they scratch it off, and then reveal the donation amount you’ll request of them. Scratch cards are known to be the most profitable fundraiser on the market. Some companies offer margins as high as 97%. The simple reason why they’re so profitable is because there isn’t any product for your supporters. For some organizations, they could be useful when friends and family donate. But don’t expect to big success with a scratch card if you’re "selling" in your community to people you don’t know. Big candle brands offer attractive fundraising programs. They offer an array of aromatic products in addition to classic candles. With no upfront costs and a good profit margin, candles are a solid option. The disadvantage with selling candles is the price point for your supporters. A medium-sized candle can cost upwards of $20. The product quality is nice, but candles aren’t accessible to everybody. And a disadvantage for your fundraising team is the weight and fragility of delivering candles, not to mention the hassle of taking orders. People prefer immediate gratification, not shopping from a catalog on their doorstep. 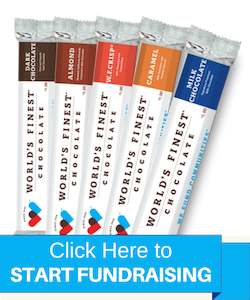 World’s Finest® Chocolate is known for high profit margins and fast, 2-3 week fundraisers. We grow our own cocoa beans, and are proud to offer made-in-the-USA chocolate bars you can’t find in any retail store. Since 1949, our premium chocolate has helped raise over $4 billion for schools, churches, sports teams, and other organizations across the country. We’re confident in our products’ selling ability...we've been doing this successfully with thousands of organizations for a long time! If our chocolate doesn’t earn you as much profit as your last similar fundraiser, we’ll match your previous profits and add 10% on top! AND if you sell out, you may earn a sellout bonus! Check out our free fundraising guide to learn more about what makes us your best choice for fundraising. Or, get in touch with your local representative to learn how to get started quickly.